I for my part believe that a place that paralyzes and freezes the brightness of noonday hides more secrets than a dark room in which someone is holding a seance. The pressure rose slowly at first, but then rapidly. The levy of a war tax on one side was answered with the lengthening of the term of military service on the other; partial mobilization on one side was answered on the other by full mobilization. The German commanders were convinced that to prevail against France and Russia they would have to destroy France quickly before the slow Russians could assemble their armies. But that meant they had to strike first: they could not allow the Russians to mobilise. Human will seemed powerless in the face of unfolding events, long-determined plans, strategic necessities, the requirements of national prestige — for the most terrifying thing about this, the most bloody war Europe had ever known, was that no one had wanted it. 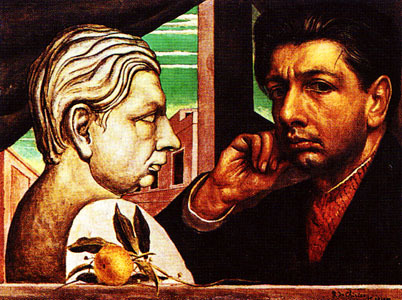 In Paris the twenty-six-year-old painter Giorgio de Chirico was filled with the sense of the meaninglessness and madness of life. The son of an Italian railway engineer, he was born in Greece and grew up familiar with ancient legends, with myth, tragedy and a strong sense of fate. He believed in signs and in predestination, magical places and the astrology and studied ancient Greek religion. He was also a student of Nietzsche and Schopenhauer. De Chirico's feelings about the senselessness and terror of his time were worked through these symbols and ideas. He was one of the most truly "disturbing" of modern painters. 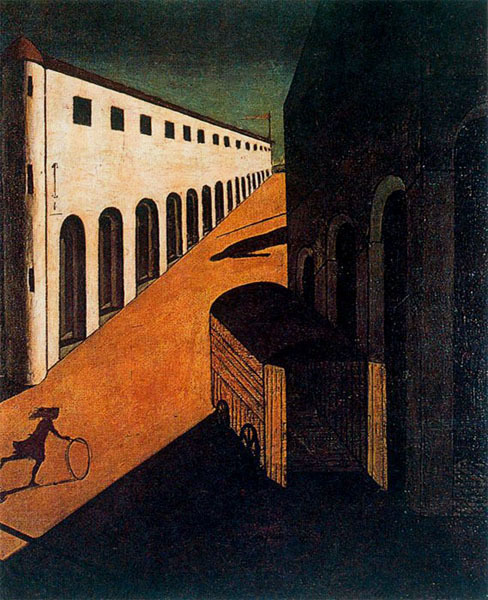 De Chirico conjures up menacing Italian piazzas which seem to conceal the key to a looming catastrophe. 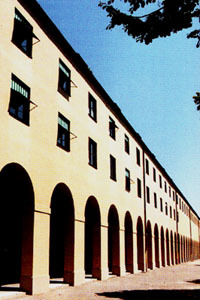 His colonnade-lmed facades seem to be the surface of an isolated world; to reflect the hot light of a shuttered noon. The purpose of his "Metaphysical Painting" was to reveal invisible forces, fears, emotions and shadows concealed behind the world of visible things. He played with allusions and like the ancients delighted in riddles and enigmas, such as the Sphinx, the oracle at Delphi and the Sybilline Books. What is the significance of the painting of 1914, Mystery and Melancholy of a Street? Could it signify anonymity, the solitude and menace of a great city? The work seems to evoke a mood which many of us have sensed before, of doom and evil, and of the senseless and unavoidable, bearing down on us. It is difficult for us not to see the work as a prophecy of what at the time was called "The Great War".